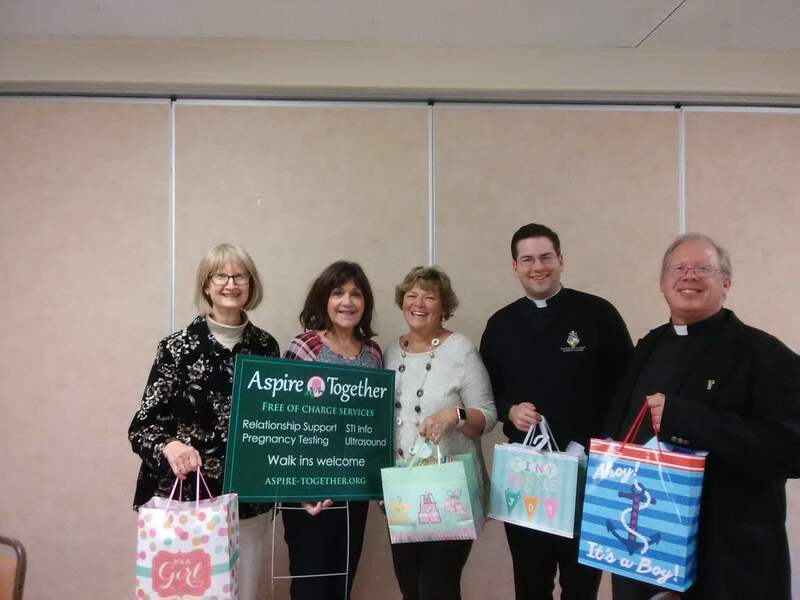 Photo Credit: Submitted photo - Gifts from this year’s Spiritual Adoption Baby Shower on Oct. 21 at St. John Vianney Parish in South Burlington are presented to Terri Seward from Aspire Together in Burlington (second from left). Also pictured (from left) are Cecile Wagner; Monica Smith, parish council member; Father Steven Marchand, parochial vicar; and Father Patrick Forman, pastor. For some members of St. John Vianney Parish in South Burlington, New Year’s resolutions included a promise to pray for unborn children in danger of abortion.The Spiritual Adoption Program began in the parish some three years ago after a parishioner suggested the program to Father Patrick Forman, pastor, said Cecelia Wagner, parish program coordinator.Since then about 50 parishioners a year become spiritual adoptive parents, committing to pray for an unknown unborn child for nine months beginning in January, which marks the anniversary of Roe V Wade, through October, Respect Life Month. Part of the purpose of the Spiritual Adoption Program, said Wagner, who is also a nurse and member of the parish Social Action Committee, is to educate adults and children about the development of the pre-born baby. To facilitate that learning, Wagner prominently displays a progressive series of Watch Me Grow posters in the narthex of the church each month to accurately depict the growth stages of the child in the womb. At the end of the nine months, a baby shower is organized and spiritual adoptive parents are invited to bring gifts that would help new mothers and their babies. All proceeds are donated to pro-life groups, which have included two Burlington agencies — Birthright, a non-profit charity providing friendship, help and support for more than 26 years to women facing unplanned pregnancies, and Aspire Together, a locally supported faith-based organization offering compassion, hope and practical help to those facing pregnancy, relationship and parenting journeys. A speaker from the pro-life group is invited to each shower to provide talk about the group’s mission of helping babies, their mothers and families. Parishioner Pat Loller is instrumental in coordinating the baby showers, said Wagner, including making sure every adoptive parent receives an invitation. Wagner, who is a widow, mother to seven children and grandmother to seven, is also a member of the parish twinning ministry with St. John the Apostle Parish in Boc Banic, Haiti. She suggests that any parish, school or organization interested in beginning the Spiritual Adoption Program contact Bob Paige at [email protected] or at P.O. Box 217 Novi, MI 48376. For additional information visit SpiritualAdoption.org.